ULTRA CLEAN filling line for milk and drinking yoghurts. 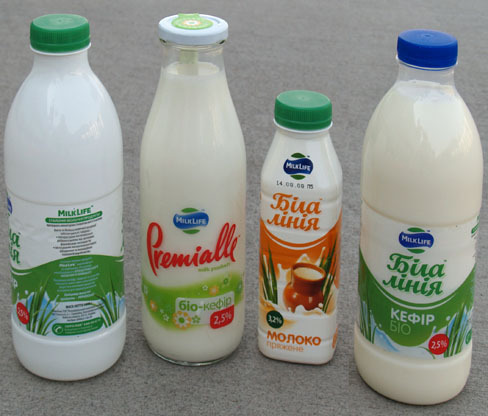 In July 2008, INDEX-6® delivered and put into operation an ULTRA CLEAN filling line for milk and drinking yoghurts in the “Belocerkovskii” milk factory, owned by “Terra Food” company in Ukraine. The line is designed to work with PET and glass bottles with twist-off caps and is for a capacity of 6000 bph for 1 liter pasteurized milk and 9000 bph for 0.33 and 0.5 liter drinking yoghurt. In the glass bottles will be filled premium segment production with trade mark “Premialle” and products for children from the “Baby life” brand. In the PET bottles will be filled products with the trade mark “Belaia Linia” (white line). Tribloc for sterilization, weight filling and combined closing – IND-Dose 49 RRWTC 32/24/8 Ultra clean version. Sterilization of the bottles and the caps is performed by a hydrogen peroxide solution (H2O2) and rinsing is with sterile water. The caps are additionally sterilized, prior to entering the clean chamber of the machine, in a UVC radiating tunnel. The tribloc is equipped with automatic peripheral devices for preparation of hydrogen peroxide solution (IND - HOS), sterile water (IND - SWS) and an automatic CIP (IND – CIP S3). Filling is performed in clean environment using electronic, weight-controlled valves. The closing column IND-Close 22 is with eight magnetic closing heads with smooth hysterezis regulation of the closing torque. It is equipped with a Pick & Place device with two automatically selectable positions for caps picking – for plastic screw cap for the PET bottles and a metal twist-off cap for the glass bottles. Two separate automatic orientators IND – Feed 76 are provided for the plastic and the metal twist-off caps. The different products are labeled in three different ways – with self-adhesive label, hot-glue polypropylene label from a roll and a full-body thermo-shrinkable sleeve. For the purpose the line is equipped with three labeling machines –, IND-Lab 32B, GM 360 and IND-Lab 38 together with a steam thermo-tunnel. The products are packed automatically in thermo-shrinkable foil on the IND-Pack 29 Classic packing machine. The line is equipped with a central control panel and all the necessary single and multi-lane conveyors for transporting and buffering purposes from the IND-Trans 71/72/73 series.